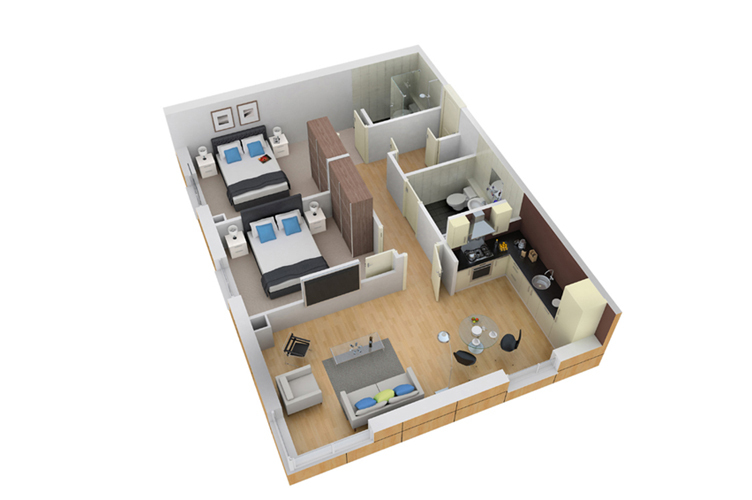 The most common site and floor plans used in brochures and websites are site and floor plan colour ups. These are cost effective and quick to create. But they have limited visual impact. 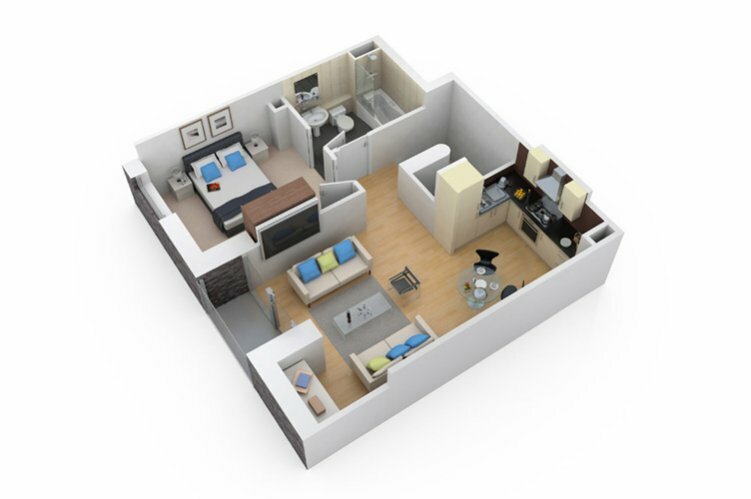 We create 3D floor plans either from a birds-eye view looking straight down or from an angle. 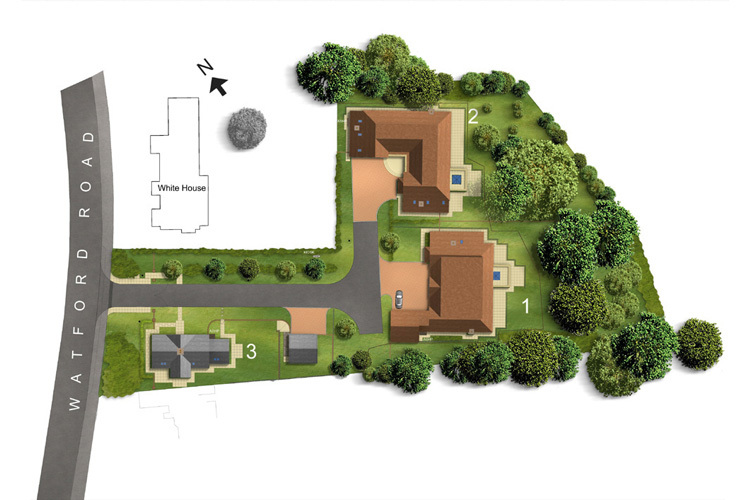 We also produce site plan colour ups with 3D landscaping and textured roofing with shadow effect. The difference is the same as between chalk and cheese. 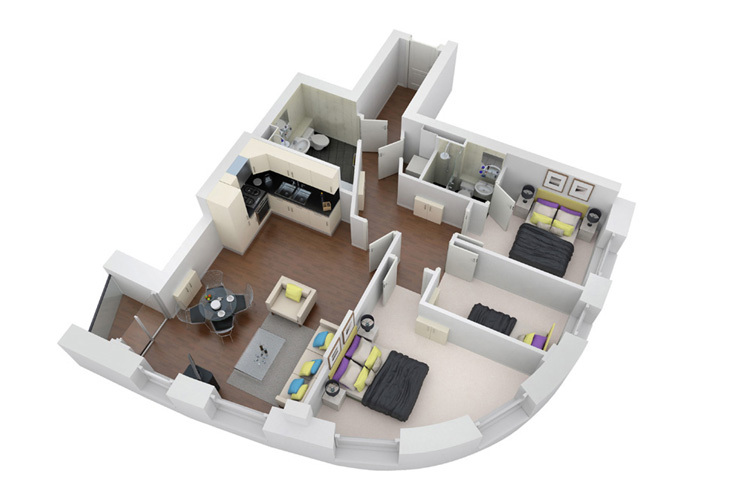 This is a 3D architectural birds-eye view of a 2-bed apartment in the north of England. Fixtures, fittings, wall and floor coverings were selected by the client prior to the 3D modelling and rendering process. This is a 3D architectural birds-eye view of a one-bed apartment in the north of England. Fixtures, fittings, wall and floor coverings were selected by the client prior to the 3D modelling and rendering process. 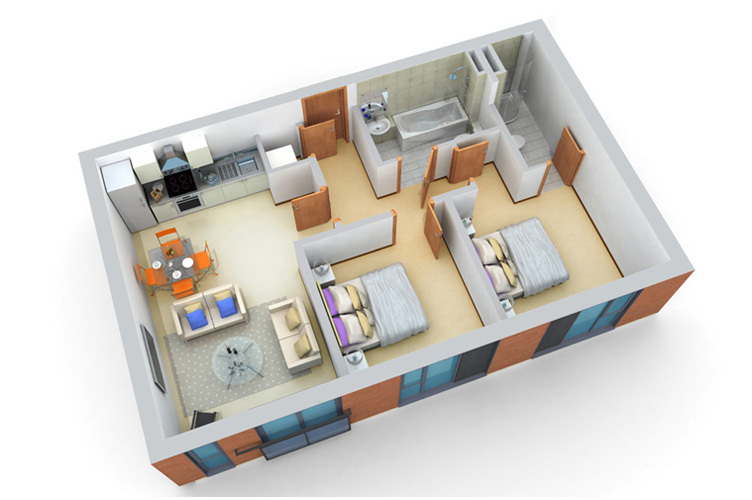 This is a 3D architectural birds-eye view of a 2-bed apartment in the north of England. Fixtures, fittings, wall and floor coverings were selected by the client prior to the 3D modelling and rendering process. Part of the exterior of the apartment can be seen in this cgi. This is a site plan colour up of a Banner Homes development with 3D landscaping and roof textures with shadows. 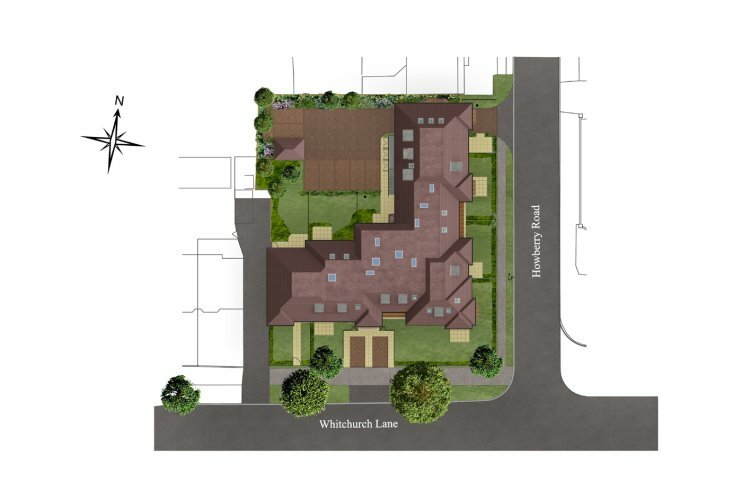 This is a site plan colour up of a Banner Homes apartment development with 3D landscaping and roof textures with shadows. A 1:150 scale model with individual apartment lights was manufactured for this site. 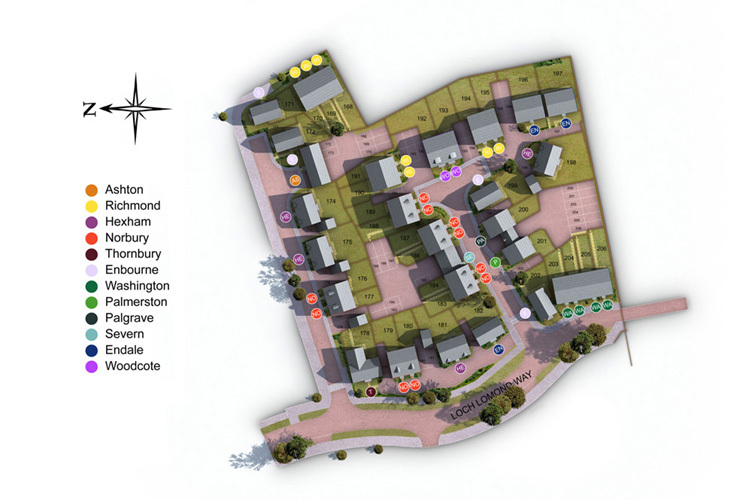 This is a site plan colour up of a Barratt Homes East Yorkshire development with 3D landscaping and house type key. 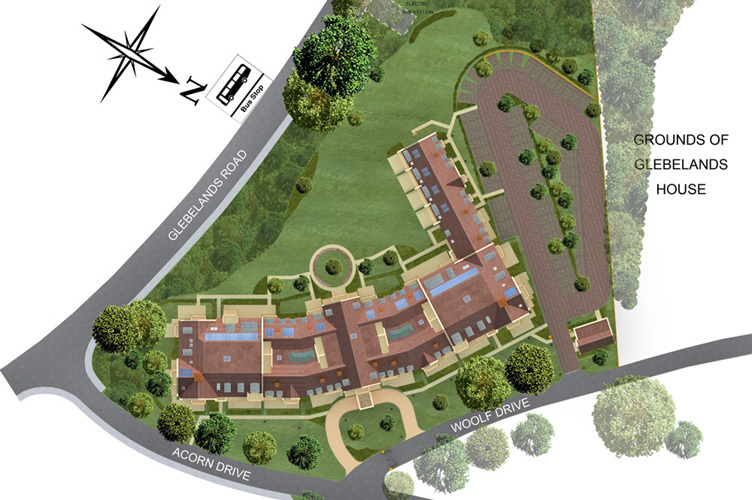 This is a site plan colour up of a Girls School conversion to residential properties in Sussex. The new Mews properties are numbered, as are the apartments in the original building. The site plan colour up has 3D landscaping and textures to the roofs. 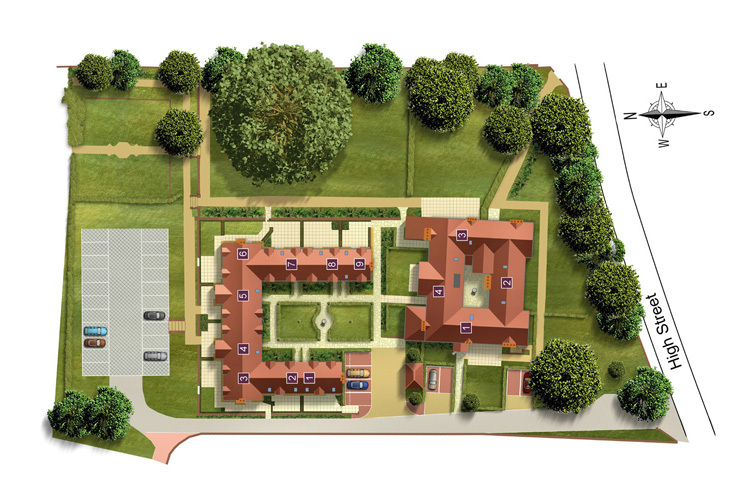 This is a Barratt Homes site plan colour up with 3D landscaping and textures to the roofs. It also includes a house type key. 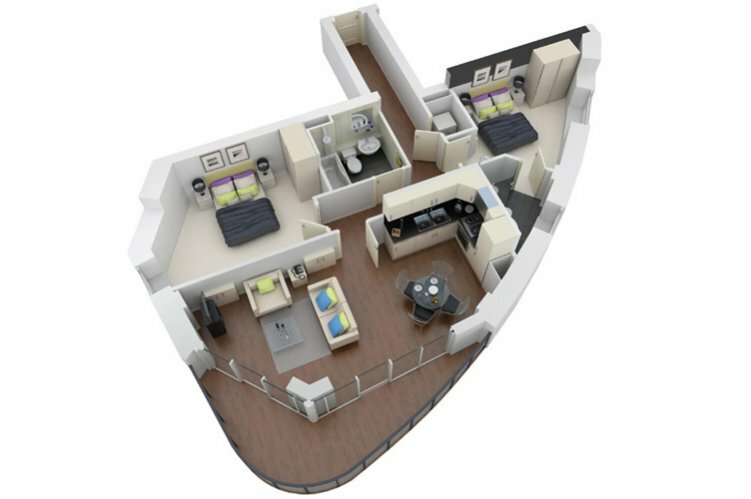 This is a 3D architectural birds-eye view of a 3-bed apartment in the north of England. Fixtures, fittings, wall and floor coverings were selected by the client prior to the 3D modelling and rendering process. 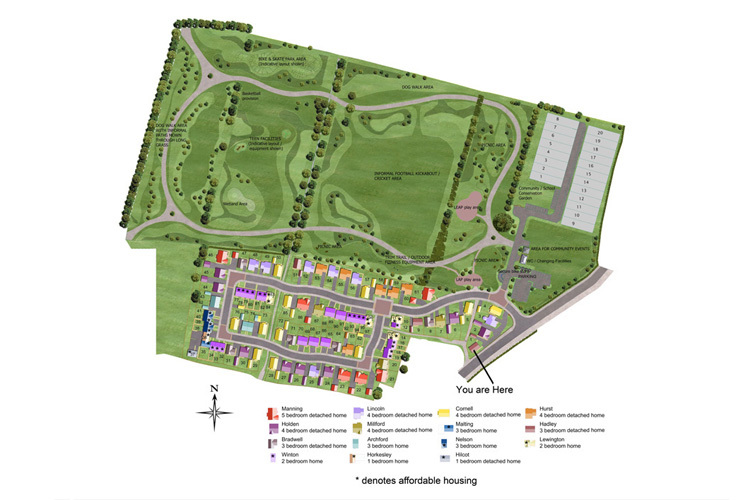 This is a site plan colour up with 3D landscaping produced for Banner Homes.